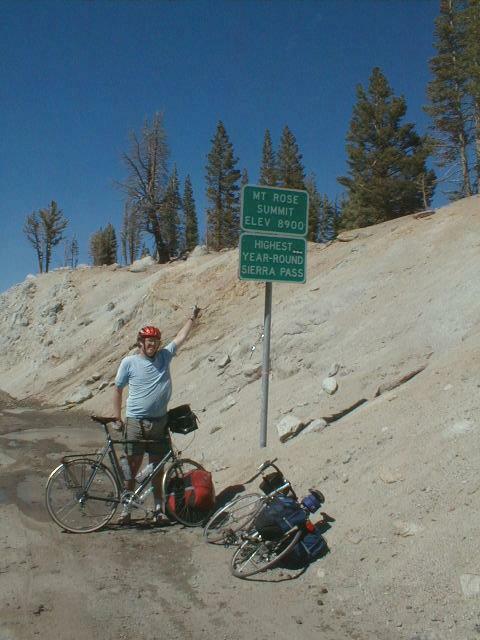 In June 1999, John Leo and I bicycled 476 miles from San Jose to Reno, Nevada by way of Yosemite and Lake Tahoe. This page provides a few of the highlights and pictures from the trip. I would recommend this route for someone considering a week-long tour starting in the San Francisco Bay Area. John has written up a description of the trip with pictures as well. John and I had both been thinking of riding the Sierra Nevada and were pretty excited as we planned out the trip in April. For preparation, we took three shorter rides in the area: a day trip to Mt. Hamilton, a day trip along the coast from Golden Gate Bridge to Santa Cruz then over the mountains and a three day trip from San Jose to San Luis Obispo. Felt like we were fairly well prepared for the ride. Why is going downhill harder than uphill? Departure time was 6:30am. San Jose was still quiet and cool as we cycled through the middle of the city and then up to Alum Rock Avenue. By 8am we had reached CA 130 and the start of the climb that would take us to 4209 feet and the summit of the highest point in the Bay Area. The route up Mount Hamilton was still fresh in my mind. 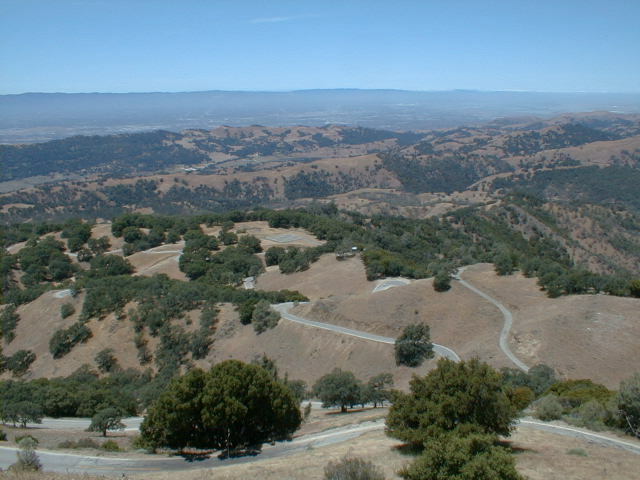 Just a few weeks before, John and I had ridden to the summit as a training ride. While my slow steady pace wasn't going to set any speed records, the road up seemed easier than the last time. This despite now riding a loaded bicycle. I suspect this was mostly due to an earlier start and thus cooler temperatures. Up to mile marker eight or so, the road goes steadily up the side of the valley. Nice views of the city gave a good sense of progress. John is quicker on hills (up & down) and so we made our way up at our own pace. After mile eight the road was somewhat level before descending past mile marker ten and eleven. We had a brief water and refuel stop before climbing the next segment of the road. There was one more drop around mile marker fifteen before the final climb to the summit. About a mile from the summit, I noticed a somewhat rhythmic bobble in my rear tire. This didn't look good. Still it wasn't fatal, so decided to first ride to the top and then investigate. At the top, discovered that part of the sidewall was tearing. It was hard to tell if I had hundreds of miles left before a blowout or just a few. Just to be safe I figured I would swap in a new tire. As I said to John, "I'd prefer not to hear a...thump, thump, thump, bang! as the tire first popped out and then finally caught to explode." 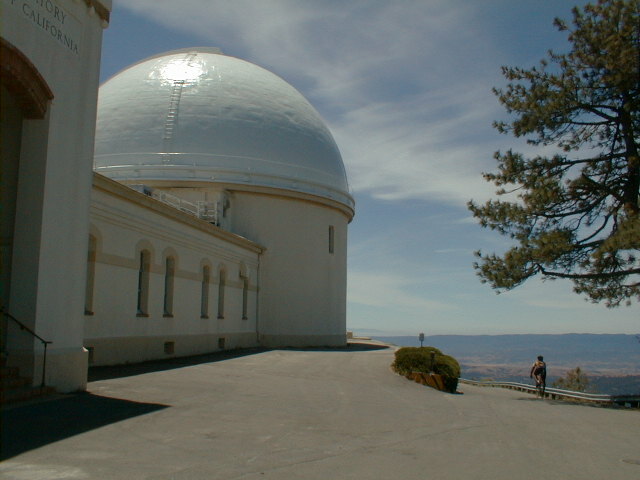 We also ate an early lunch at the top of the Lick Observatory at the top of Mount Hamilton. Despite the tire change, it felt like a good climb and start to the trip. 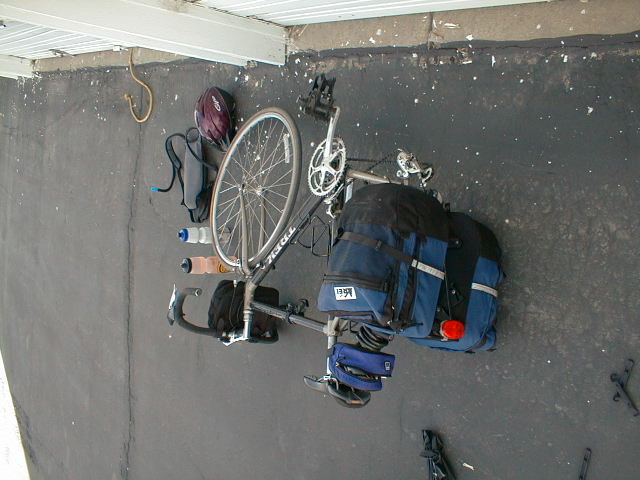 Before heading down, I rode around the parking lot to make certain the tire was seated well and wouldn't pop out. After lunch, we started down. There was a brief stretch of flat, before a sharp descent. John was ahead and went down the hill first. Just as I was cresting the hill, I heard, "thump, thump, thump, bang!". Wow! Somehow this new tire hadn't seated well. I was a little spooked. Looked like the tire hadn't seated completely and thus the tube popped out. I put in a new inner tube and inflated the new tire @ 50 psi instead of 110 psi just to be sure. I was spooked and a little slow going down hill. Unfortunately, I hadn't caught John, so he had an uncertain wait until I arrived. From here we still had several more miles of descent down to ~2000ft. As I rode along the level, the bike was riding slightly funny. Embarrassingly, I discovered I hadn't redone the quick release. After a five+ mile descent, the road levels off and also climbs over and through a few drainages. Temperatures were very hot. The combination of hot temperatures, slight climbs and mechanical problems meant we went quite slow. 19 miles from the summit was a road junction and a small cafe. Surprisingly, those 19 miles down seemed harder than the 19 up the hill. Water and cool refuel at the cafe before descending 24 miles along a river valley and intersection with I-5. The minimal scrubby trees disappeared close to the bottom as it became hot. Fortunately, there was a slight up-canyon wind that cooled things off. We crossed I-5 and made our way into Patterson for a McDonald's stop. At this point we were in the Cental Valley, very flat and with fruit trees. This area prided itself as being Apricot Capital of the World. Despite the lack of other trees, many of the cross-streets were named for trees, e.g. Elm, Los Palmos,... 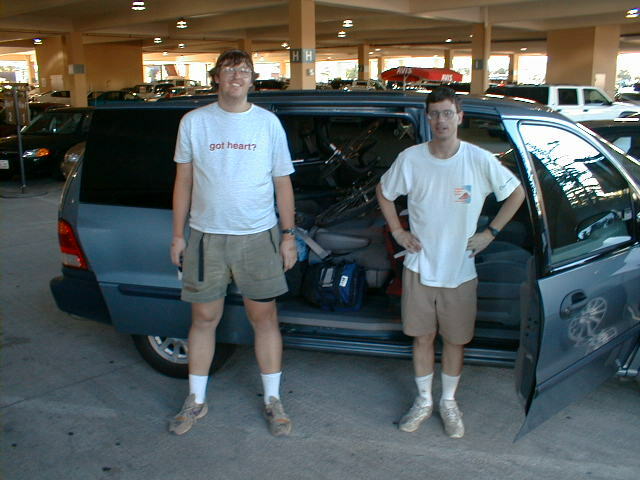 The ride to Turloc Motel 6 was flat and level. The end of the day took longer than we thought and were in after 6pm. It felt good to be on the road. Today we decided to leave early to beat the heat in the Central Valley. The sun hadn't yet risen as we cycled our way through Turlock. I had put my tire pressure back up to 70 psi, though it still bobbled slightly. We missed a turn in downtown Turlock and started heading further north. Fortunately this was quickly corrected with detailed maps John had brought along. John and I had different map styles. I had two California maps. John had detailed AAA maps for many of the small places along the way. 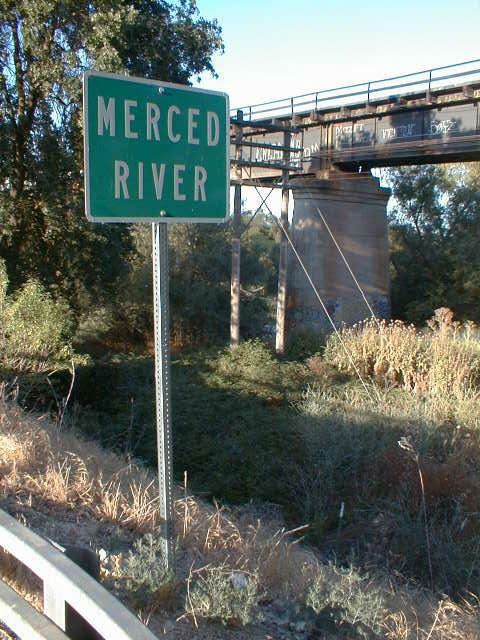 Turned south and followed the railroad tracks to Merced. Along the way we crossed over the Merced River. It was a quiet dirty stream and nothing like would be higher up. An old armchair sat in the middle of the stream with water flowing up to midway. Merced looked like a poor town. WIC program offices, thrift shops and mostly quiet streets as we cycled through Sunday morning. Fortunately, we found a good small restaurant for breakfast. Following breakfast, we completed the flat central valley, cycling over to Planada. At this point we went at our own paces. John went ahead to the motel at Mariposa. I plodded along a little slower towards the same. After Planada it started getting very hot. The grass on the hills was golden brown. There was no shade. The route went around, over and through some low hills as it climbed up towards Cathy's valley. The heat and hills caused my speed to correspondingly drop. I finished off one water bottle and then a second. Feeling pretty worn out when I stopped in at the first general store in Cathy's valley. "Sorry our cooler is out, so the drinks are lukewarm" said the clerk. Lukewarm or not, they were still wet. 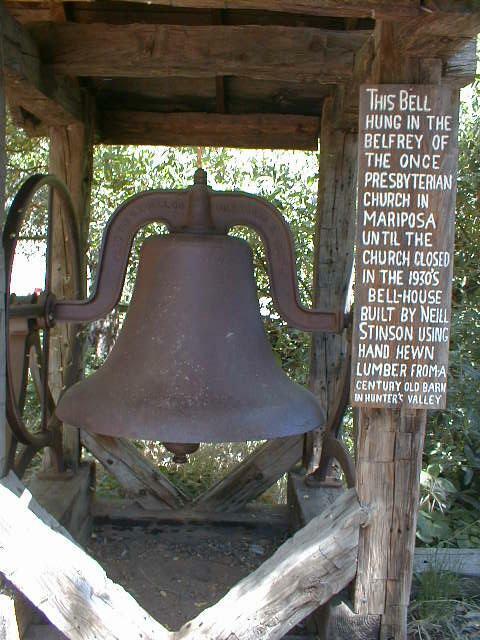 I asked the clerk about the road ahead to Mariposa, "ten miles or so and all up hill". The expression on my face must have caused her to add, "oh, there may be a short downhill to get a breather". The next few miles went very slowly. From the store, the road continued climbing. I wasn't quite certain how high I had climbed so far. Fortunately, several miles later as I saw the Cathy's Valley sign that said, elevation 1400+ feet. Wow higher than I thought. Soon thereafer I crested a hill and had a nice descent. 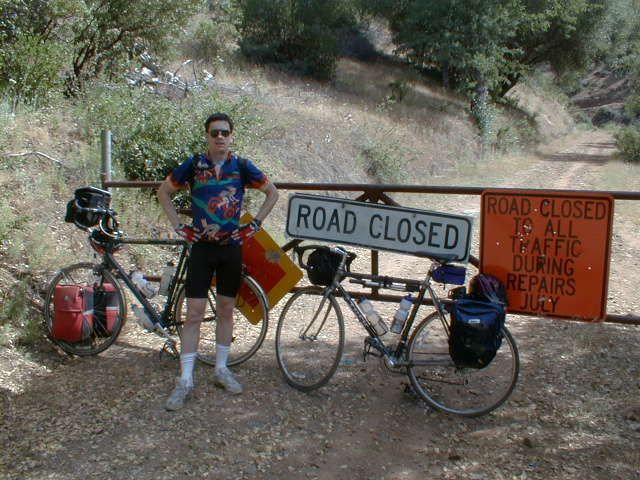 The road climbed slightly, but less than I had been led to believe and included a good descent into Mariposa. While it wasn't yet 2pm, the heat and route made for a long day. I wandered around town. Good ice cream! Some nice historical exhibits. A pretty good pizza place. Early to bed for another early rise. When we started today, we were missing two important pieces of information. In hindsight, it turns out that this would be for the best. I started half an hour before John. The initial route climbed out of Mariposa to the Mid Pines summit nearly a thousand feet higher. The temperature was cool and there were trees along the way. Despite the elevation it went quickly. From Mid-Pines summit started a 2000ft descent down to the Merced river. Zoom! The road was the right grade and thus didn't require much extra braking to slow down. Last few miles the trees disappeared. The Merced river was much more active than before. The road followed the canyon along the river. A very gradual ascent. 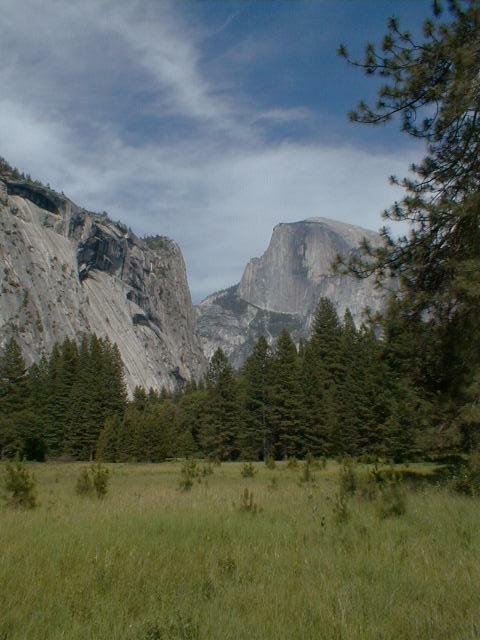 Roadside signs indicated that rocks in the area were amongst the oldest in the Yosemite area. It was still cool. After fourteen miles along the river, we came to the Cedar Lodge in El Portal. This establishment was recently notorious as the last known sighting of three women vacationers from Eureka before their bodies were brutally found elsewhere. This unfortunate event played for several weeks in the San Jose papers and hence I had already heard of the Cedar Lodge. Breakfast buffet! Dangerous to have for bicyclists :-). Fortunate for them, I had already snacked on apples and granola bars earlier and thus couldn't get my full money's worth. Shortly after leaving the Cedar Lodge we were stopped by a Yosemite Park Ranger. 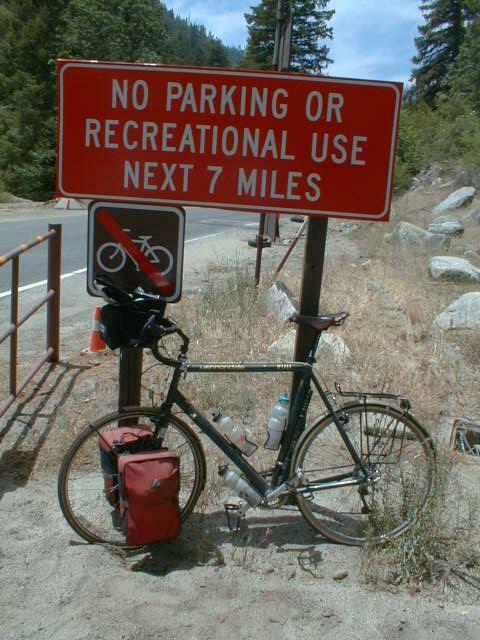 He informed us that no bicycles were allowed on a 7 mile stretch of 140 ahead. We had known about road construction, but not about this. Just as the options looked exhausted, the ranger mentioned there might be another possibility. From the town of El Portal itself, there was a jeep road that led six miles up to Foresta and into the park. We probably couldn't ride, but perhaps if we hiked with our bicycles? Great! Foresta Road it was then. In El Portal it was paved, but after it left town there was a closed gate and just jeep road. We briefly took a long turn and did two hundred feet of climb to the water tank about town. After correcting that mistake we headed back along the road, pushing our bicycles up the hill. El Portal was 2100ft and Foresta was 4300ft so we had a bit of climb ahead of us. It was a nice hike. A few light clouds kept the hottest sun off, though I still went through all three water bottles and needed to purify some more. Closer to the summit, we crossed by three nice water falls. After the third falls, it leveled out slightly and we reached Foresta. Pavement! Wow, this was nice to ride on. We bicycled through Foresta and then further up the hill to 4750ft were we met up with 120 and almost a 1000ft descent down to Yosemite valley. Original plan had been to do some hiking, sighteeing in the valley. 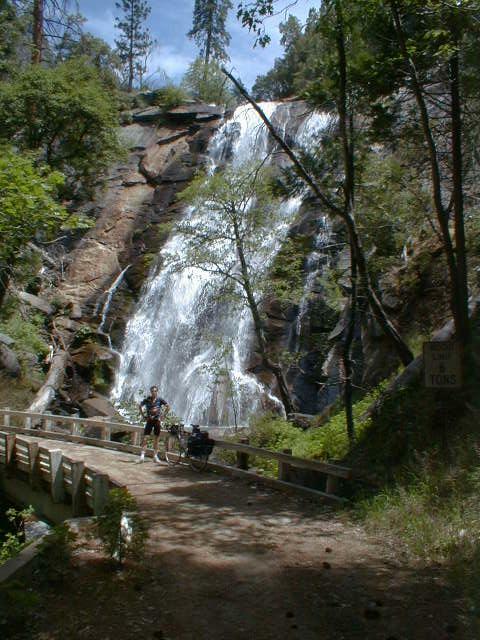 We had done some of that along the way, so mostly did the local places such as Bridalveil falls that came along the way. We also stopped in that Yosemite village to look at the visitor center. At Curry Village we received the second news of the day. Our reservation was cancelled. They had left a message for John on his answering machine at home. All this despite allowing John to upgrade the week before. The reason for the cancellation was the periodic rockfalls they had recently had including one that killed a climber on June 13th. Fortunately, they were fairly quickly able to switch things around and get us in a nice cabin with plumbing for the same price as we otherwise would have paid. It was nice to get into Yosemite valley and look around. 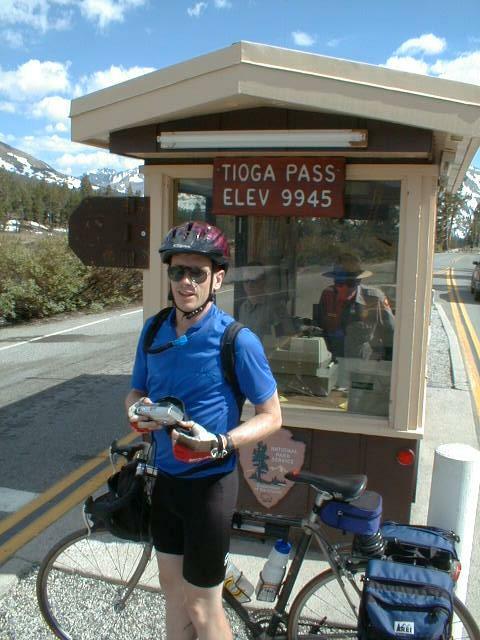 Tioga Pass. My anticipation was that this would be the toughest part of the trip. Over 6000ft of climb up to nearly 10,000 ft. I left very early and also before John. The valley was still quiet. Some amusing signs were up, "Management Fire Do Not Report", presumably referring to local preventative burns. The first six miles were slightly downhill to the road junction with 120/140. Since it was still before 6:30am, the road to El Portal was still closed to all traffic. From here, the road climbed steadily out of the valley. Impressive views back including Half Dome off in the distance. Also three tunnels to cross. Fortunately the longest one had lights and the others were shorter. It was still early when I reached Crane Flat at 6000ft. From Crane Flat, this next stretch of road to Tuolumne Meadows it at a more constant altitude. However, this isn't to say there aren't some fair climbs and descents. I must have crossed the 8000ft mark half a dozen times. Around 8000ft we also saw some snow off in the trees. Not all the campgrounds were open yet, as the main road had been open about three weeks. We stopped briefly in White Wolf, before continuing on across Yosemite Valley. After Yosemite Valley there was more exposed and bare rocks. Also some very impressive views down across the valley. Tenaya Lake was both a lunch stop and a place to purify some more water. From Tenaya Lake there were one more drainages to cross into before reaching Tuolumne Meadows. The views of the meadows were impressive. Very wide and expansive skies, large green meadows and streams and bogs around. Despite the anticipation, it was turning out to be a fairly straightforward ride. 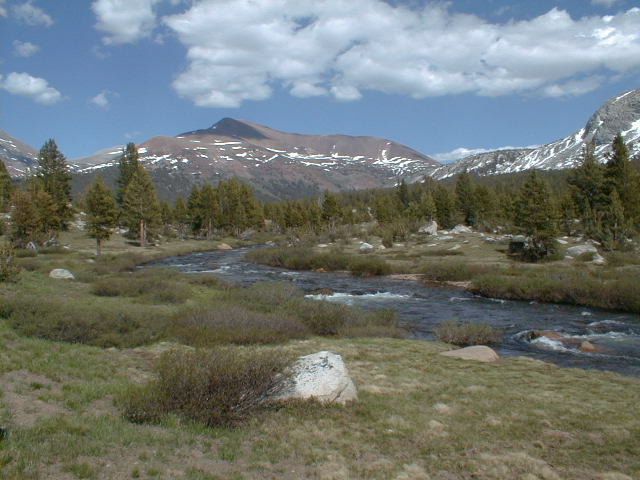 From Tuolumne Meadows, we climbed the last 1400ft and 7 miles up to the pass. Stopped for the obligatory photo shots. We also got a first look at the 3500ft descent in the valley below. The descent was fast, a bit too much, as I rode my brakes fairly cautiously. As we were almost down, we got some good views of Mono Lake, among the water sources used by Los Angelos. We also noticed that it heated up quite a bit and the landscape again looked more dry and barren. What is in the blank space in the map? Despite the mileage, today was an easy day. Route 395 is a major truck thoroughfare but otherwise a nice route along the eastern Sierra Nevada. I figured it would be hot and kept with the pattern by leaving early. A little past Mono Lake, I came upon a motorist along the road. His car had broken down and he was complaining he didn't have a jack. I couldn't offer him much consolation other than reassurance that I'm sure other traffic would be by soon. I also didn't take him up on his offer, "I'll trade you for your bicycle". Coming out of Mono Lake is a nice climb up to Collins Summit. From here an excellent descent down into Bridgeport and breakfast. 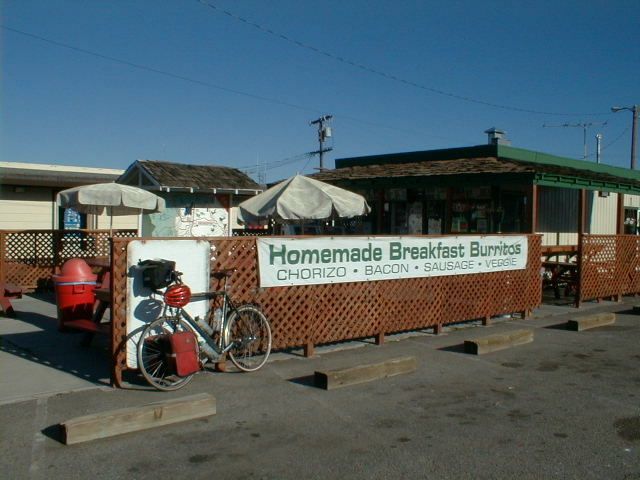 We ate at a small cafe and not the burrito place in the picture. Fellow patrons and wait staff were friendly and wishing us well on the trip. Apparently, there was to be a motorcycle ralley the next few days in town. From Bridgeport came the next ascent up over the hills to Devil's Gate. This one was lower than the first, though still took a bit. Coming down from Devil's Gate, the road descended along the Walker River and past the town of Walker. Another excellent gliding ride along the river before it leveled off. It was starting to get pretty hot when we reached Topaz Lake and the Nevada Border. Another state to have bicyled in, great! We had an inexpensive lunch in the Topaz Lake Casino. Surprising how much glitz they build with these things. Also surprising how close they are situated to the California border. From Topaz Lake there was a blank space on the map in the 22 miles to Gardnerville. We figured there might be a small climb, though it turned out to be bigger than expected. It was also pretty hot, though still bearable. Reached Gardnerville in mid-afternoon and in good spirits. Briefly thought about doing the climb up to Lake Tahoe, but decided against it as it would be better to do the Kingston Grade in early morning cool temperatures than afternoon heat. Last day of riding, already. Today would bring two 2500ft+ climbs so started early again. Climbing up to Tahoe, could see well the Carson Valley including farms and numerous small towns. The ride to the top was a slow steady 8.1 miles most of which had vistas into the valley below. 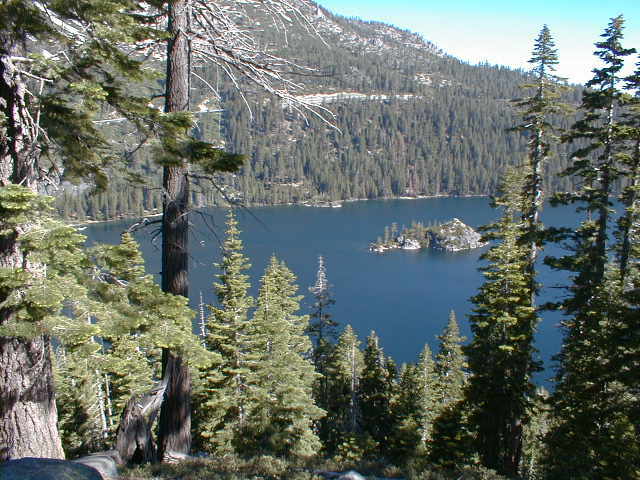 Once over the summit, could see the beautiful waters of Lake Tahoe. A somewhat short descent to US 50. The signs said 9% grade on the way down, but I doubted it. 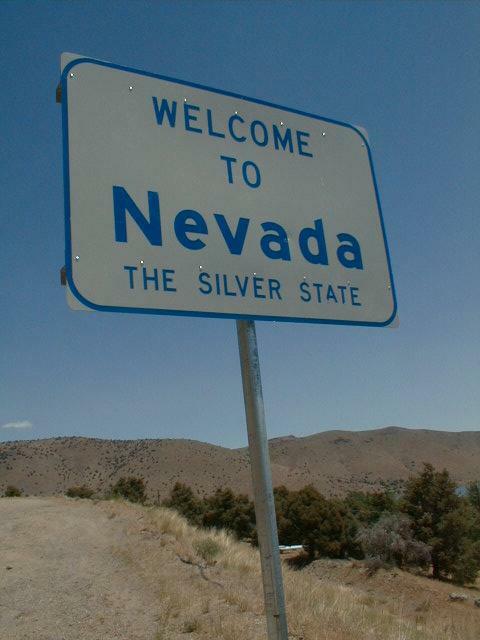 Once again, the casinos in State Line, NV were crowded right up to the border with California. We would cross over to California along the west side of the lake. We'd chosen the west side due to reports of better scenery. A short breakfast stop in South Lake Tahoe and we were off along the lake. One sign said that Lake Tahoe was deep enough that if its waters covered the state of California, it would be at a depth of 14 inches. The water was also nice and blue against peaks on the side. I was surprised not to see more ski areas or indication of ski areas. Particularly since this would be the destination for many Bay Area skiers. We crossed onto 89 along the west side. The road was surprisingly hilly, particularly as it led up to and around Emerald Bay. Emerald Bay had a small island in the middle, the only island in the entire lake. It made for a nice scenic stop. After Meeks Bay and the county line, the route flattened out considerably. There was a strong southwest wind and hence tailwind to blow us along. With this assistance, it didn't take long to reach Tahoe City. After Tahoe City as we approached the NV/CA border again we came up against some road construction. We could ride along the right side of a long line of waiting cars but then had to wait with everyone else as they allowed traffic to back up. The flaggers let traffic sit for quite a while and so you could hear the car horns in the distance as impatient drivers waited their turn. We talked briefly with one flagger who listed the two seasons of Lake Tahoe, "winter and road construction". Fortunately, we were soon past the repaving and then heading up to Incline Village. Our original plans had been for lunch in Incline Village but we must have bypassed the main town and didn't see anything along the way. From Incline Village was another slow 7 mile climb. It was warmer than before, but not too bad. The tailwinds also helped push us over the pass. From Mt. Rose Summit we could see 4000+ feet down to Reno including a rather large brushfire in the distance. Several fire trucks zoomed past us on the hill. The descent was good, though again a little steep for my tastes. Once we got below 6000ft, the trees went away and we were back to semi-arid scrub. We reached 4600ft and the junction with 395 before stopping for a late lunch. Our original plan had been to take Amtrak back on Friday. Over lunch/dinner we explored the possibility of renting a car to drive back. A call to Hertz and there was a possibility. Cycling our way to the airport, John hit a piece of glass and we stopped to fix the flat. This part of the route continued with strong tailwinds and slight downhill so was very easy to coast into Reno for the end of the trip. At the airport, we were able to get a car and drive back to the Bay Area. Overall, this trip worked out very well. We were fortunate with the weather and didn't use mittens, hats, long-sleeved shirts, and all the other cold gear we packed. We had a few surprises but nothing we couldn't cope with. The spectacular scenery, particularly of Yosemite and Tahoe also was impressive.